2014 Press Pass American Thunder Racing takes a patriotic approach with many of its designs. While the brand name was used with Wheels, it's new to the Press Pass name. Hobby boxes come with an autograph, two memorabilia cards and some inserts. 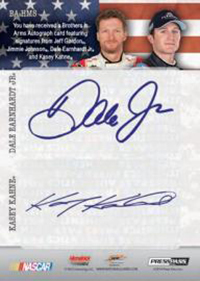 The 2014 Press Pass American Thunder Racing base set has 70 cards. 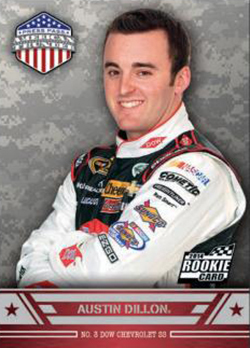 This includes eight rookies: Austin Dillon, Kyle Larson, Cole Whitt, Justin Allgaier, Ryan Truex, Parker Kligerman, Michael Annett, and Alex Bowman. Photos come from the 2014 season. Collectors can also hunt for parallels. There's one numbered to 50 or less in every hobby box. The signed portion of the set starts with American Thunder Autographs. 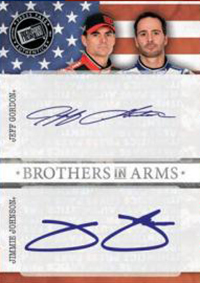 Brothers in Arms Autographs have three or four signatures from NASCAR teammates. 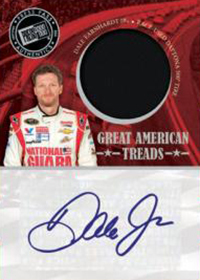 Great American Treads cards come with race-used tires from the Daytona 500 as well as an autograph. Among the memorabilia sets is Battle Armor, which have pieces of sheet metal taken from a car. Class A Uniform cards are one-of-ones. These come with a complete flag patch taken from a racer's firesuit. Click here for the 2014 Press Pass American Thunder Racing checklist.